In high school, I played in every band the school had, from marching to jazz. I worked on the craft, learning how to play different styles and increasing in speed and dexterity. I continued to spend hours in the basement, now influenced by the styles of bands like Rush, Yes and The Who. Since girls were more attracted to guitar players and singers than drummers, there was plenty of time to practice! And then an opportunity arose to be part of a professional working band. I was pumped! Only problem was that the band was called The Country Travelers and its specialties were square dances and polkas. It wasn’t exactly my thing (name one great country drummer! ), but I took the gig. It was pretty boring most of the time, and I think every venue we played in western Pennsylvania had a deer head mounted on the wall, but it was a paying gig and it honed my chops. Moreover, it taught me a valuable lesson: that laying down a steady beat is far more important for a drummer in the real world of a band than showing off. Drums are never going to be a solo instrument, unless you’re Neil Peart or Buddy Rich (and even then, nobody wants to hear that for two hours). As a drummer, you are only important insofar as you support everyone else in the band and make things good for the audience. It’s about being solid more than being spectacular. When I became a preacher, I began to see how the same principle applied to homiletics. 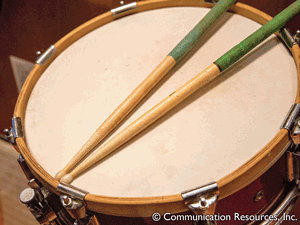 Just like learning the drums, I learned all the exegetical rudiments for bringing forth the Word. When I first started, I felt like I needed to throw everything I had learned that week into the sermon as a way of impressing the congregation. I looked for the killer illustration, the fantastic filler, and the climactic roll-out to bring it all to a close. But the reality is that no one really cares about that stuff. Most of the time when I have written a sermon that I’m very impressed with, someone will inevitably say, if not in so many words, “Just play, man.” The people of God are looking for steady preachers who bring forth a message they can dance to. They’re not there to watch you and be impressed with you, but to listen to God and pick up God’s rhythm for their lives. Good preaching is about faithfulness over time, banging the gospel drum steadily and solidly, not about brief flashes of your own personal brilliance. Stewart Copeland, the former drummer of The Police, once gave advice to his fellow drummers that went something like this: “Remember, the singer doesn’t need you, but you need the singer. Without the rest of the band, you’re just making noise.” I think that’s great advice for us preachers as well. We’ve been called to serve the rest of the band, the congregation, and to back up the real frontman, Jesus Christ. The rest is just so much noise.